Plan a Summer Excursion to the Museum! Plan the perfect summer excursion to see the General Tommy Franks Leadership Institute and Museum in Hobart! Hobart, Oklahoma is an ideal location to plan a leisurely vacation. Resting in the foothills of the Quartz Mountains, this beautiful small town features a variety of choices in entertainment, dining, shopping and accommodations. 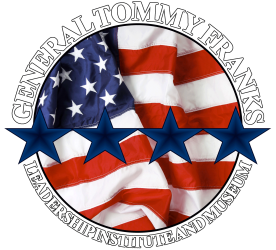 Spend a summer day at the General Tommy Franks Leadership Institute and Museum. Admission is always free to the world-class Museum housed downtown in a remodeled, 9,500-square-foot building. The Museum is open Monday through Saturday from 10 a.m. to noon and 1 to 5 p.m. Featuring galleries showcasing memorabilia and artifacts from General Frank’s personal collection, a traveling exhibition area, the Museum Store and more, the Museum is perfect for families and children of all ages. Museum visitors will experience cultural items from around the world, unique military equipment, one-of-a-kind historical photographs, videos and much more. Plus, the Museum also houses one of only two Medal of Honor awards in the state of Oklahoma as well as one of the world’s largest collections of challenge coins. Make sure you have the perfect accommodations to relax in while visiting. Several bed and breakfast lodges and hotels with a variety of suite sizes can be found nearby – so you can bring the whole family! You’ll need to refuel after spending the day at the Museum! Be sure to stay for a meal at one of the local restaurants nearby like the Kozy Diner, Big-A-Burger or Hometown Pizza. Plus, there’s plenty to do in Hobart after you visit the Museum! Plan a hiking trip in the Quartz Mountains, spend a day browsing the antique shops and boutiques in downtown Hobart, visit the Kiowa County Heritage Museum or tee-off at the Hobart Country Club. Check out a list of local accommodations, businesses and more. The entire family will remember taking a vacation in the quaint town of Hobart. With plenty of sights to see, culture and history to experience and local cuisine to enjoy, your visit can be as busy or as relaxing as you’d like. Learn more and plan your visit to the General Tommy Franks Leadership Institute and Museum today! We can’t wait to see you!